Antique Radio Forums • View topic - The meaning of deco with regard to radios? The meaning of deco with regard to radios? Post subject: The meaning of deco with regard to radios? I sell old radios at a loss. But I make up for it with quantity. Post subject: Re: The meaning of deco with regard to radios? I don't think it would be much of a stretch, though, as it certainly has the lines and the "skyscraper" look. That black skyscraper model could also be called 'Machine Age" "Streamline Moderne" is another label that is thrown around. That is easier to describe since it was used on so much architecture. The terms are used by sellers as a hook as they usually don't know what they are talking about, but they know what sells. True about the machine age look, but it's just as overused in ebay as deco. I wonder if you could do a "Item not as described" on someone who hypes deco on a generic radio? I wonder if you could do a "Item not as described" on someone who hypes deco on a generic radio? True, but on the sales forum there's a thread about a seller that sold an empty box that was clearly shown and described, and the buyer still filed a "item not as described" on the seller. I'm just curious if it could happen this way as well. A buyer can claim anything, of course, but doubtful they would win anything based on other than condition received. Before World War II, Art Decorotif (art moderne or now known as art deco) and industrial design were the two major influences of the 1930s. Before that, Most of the radio cabinets produced were some sort of period furniture reproduction, from any era 100-400 years previous to those times. I found this looking for a very detailled post (even older) by our resident art teacher Mr. Stuart Schooley, now deceased. He did a good writeup on the differences. What Martin says echoes Stuart's thoughts - much of what we call Art Deco these days is more accurately described as Art Moderne. Definition #1: "Art Deco (/ˌɑrt ˈdɛkoʊ/), or Deco, is an influential visual arts design style which first appeared in France during the 1920s, flourished internationally during the 30s and 40s, then waned in the post-World War II era. It is an eclectic style that combines traditional craft motifs with Machine Age imagery and materials. The style is often characterized by rich colors, bold geometric shapes and lavish ornamentation. 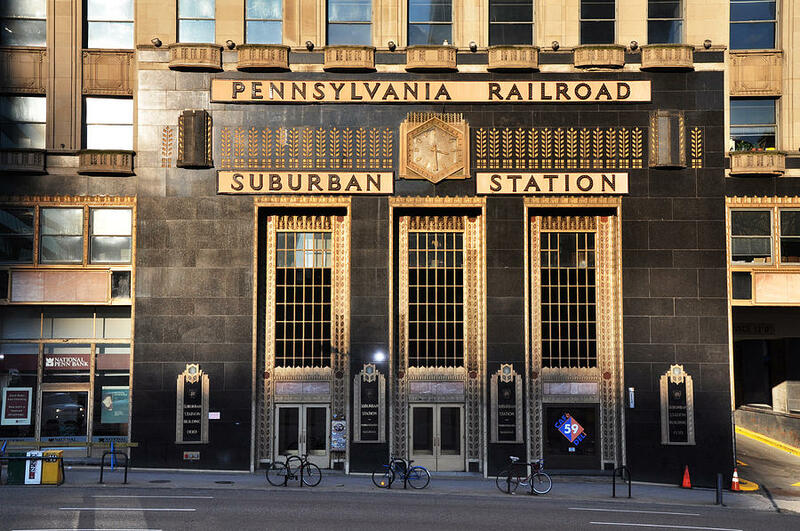 Definition #2: "The term 'Art Deco' is taken from the name of the 1925 Paris exhibition titled Exposition Internationale des Arts Décoratifs et Industriels Modernes. The most popular and respected French artists of the day showcased their work at this exhibition. Jewelry makers, graphic artists, painters, architects, fashion designers and all other manner of craftsmen and women displayed their pieces at the exhibition. All of the works had a commonality - they were not only functional, but also very beautiful (i.e. decorative). The term came up again in an article by the architect, Le Corbusier, titled '1925: Arts Déco' and in 1966 at the retrospective exhibition titled Les années '25: Art Deco/Bauhaus/Stijl/Esprit Nouveau. But it wasn't until Bevis Hiller published his book, Art Deco of the 20s and 30s in 1968 that term was used to truly define that style movement. As long as it attracts lookers and buyers, DECO means everything and nothing. Key word spamming at its worst. Ask the seller to articulate in detail the DECO design features (asymmetry, Egyptian-themed motifs, geometric shapes, for instance). Few if any can. I would expect the ignorant to respond, "well, it's obvious!" Deco in the radio world probably means "anything made before 1950, or that I think was made before 1950". If a seller thinks an item was made after 1950 and before 1980, it will be described as "mid-century modern/Eames/atomic". Quote: (Antique TV collecting) always seemed to me to be a fringe hobby that only weirdos did. I consider most anything other than the usual bland box between the 1933-34 Chicago and 1939-40 NYC World Fairs as Machine Age, Skyscraper, prewar Modernistic or whatever other label you want to toss out that doesnt look like a mass produced throwaway. Some interpetations were excellent while others downright horrible with the Howard metal boxes fulfilling the latter category. Deco sort of filled in the era just before WW2 and say 1949 with the Scott 800B, Hallicrafters S-38 and SX-42, National NC-44, 46, 200 and 240D as good examples of a few I own and like. Manufactured in the 1930s. Something art deco besides a radio. Quite an advanced design for the period. They even built a Shortwave Radiostation that way. 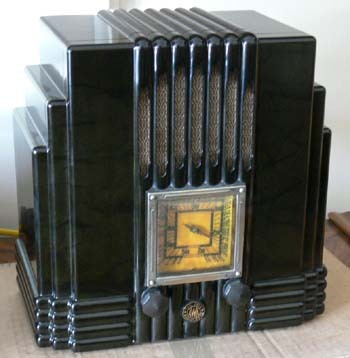 RCA Victor early on was prominent in some of their radio designs using the Art Deco Style. Their small table-top RCA Victor Model 115 from 1933 is a good example with it's skyscraper angles.